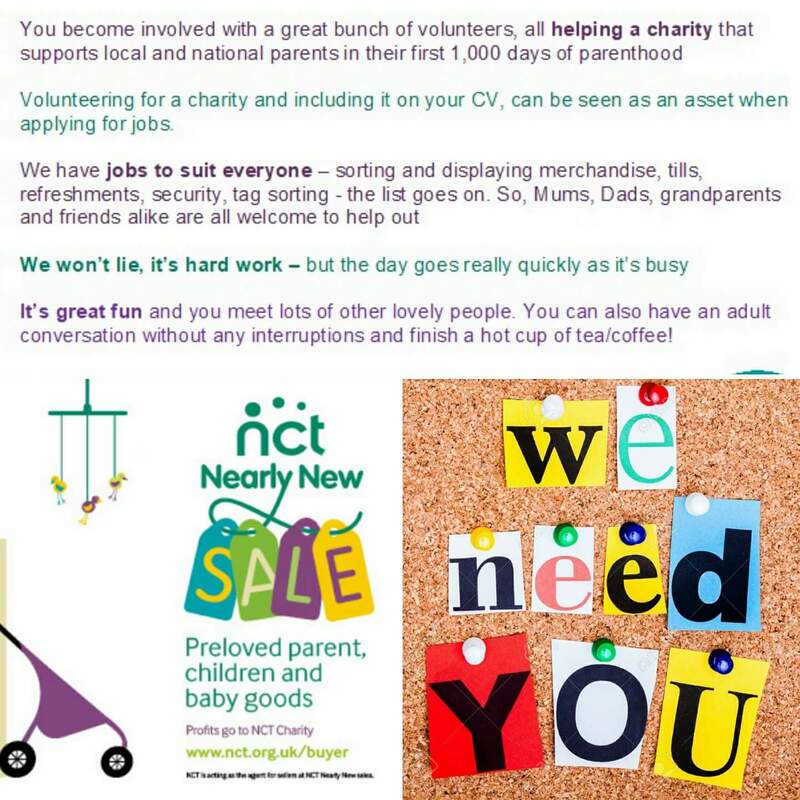 We are currently looking for people to take on various volunteering roles for the Basingstoke NCT Nearly New Sales. 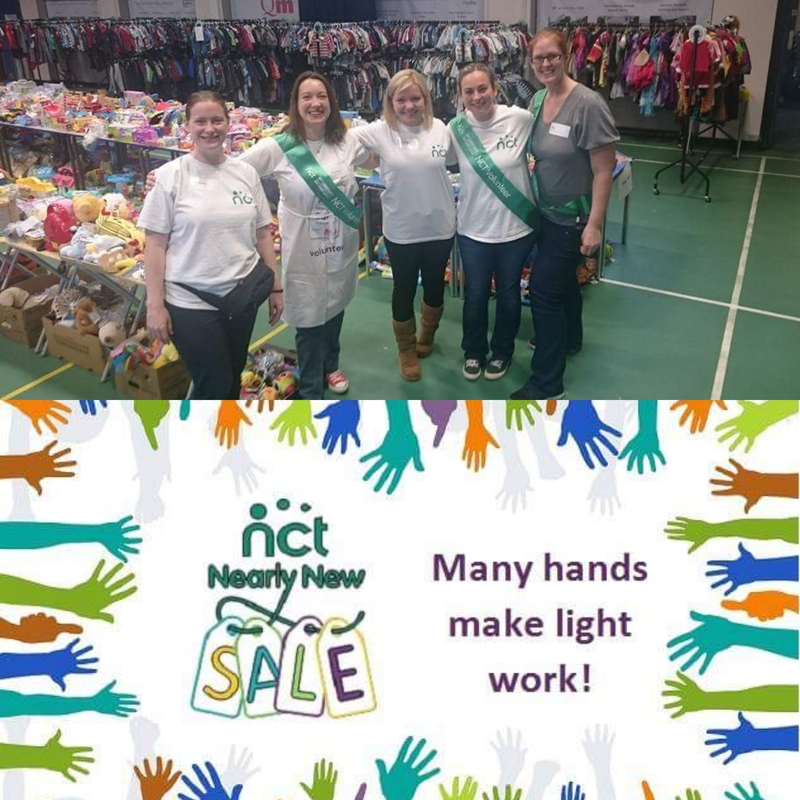 Volunteering with the NCT charity means you get a general feeling of satisfaction that you are helping people in the community; you can show transferable skills on your CV while on Maternity Leave or a stay at home Mum. What do the roles require from a volunteer ? 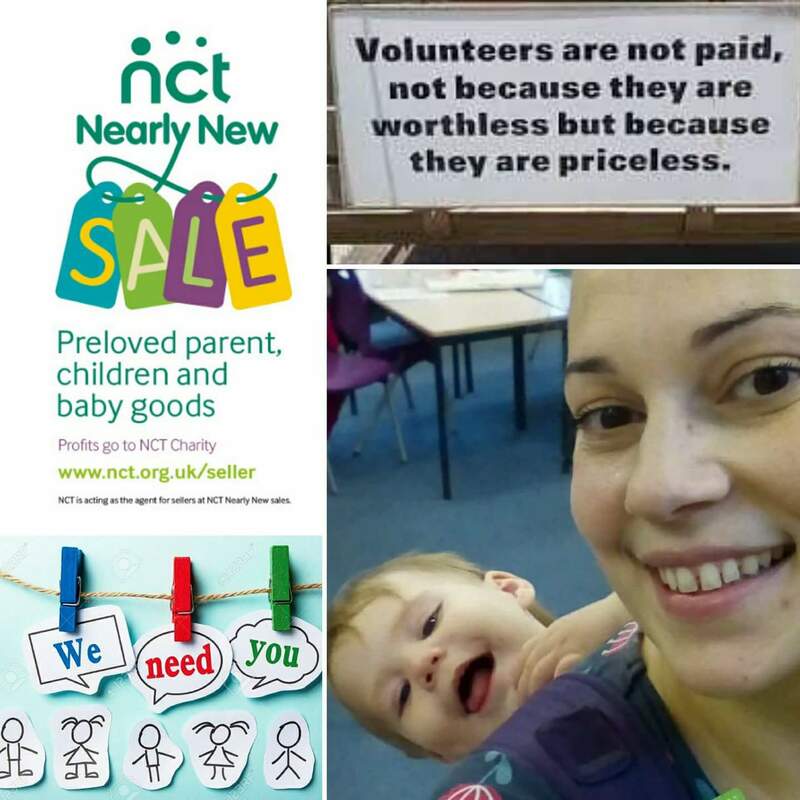 Main team volunteer roles are asked to attend a pre sale meeting and then volunteer for a few hours either split between the Friday evening preparation tasks or on the Saturday. Which is split into pre sale, sale and post sale. You can also do half your time on the Friday and half on the Saturday. Examples of roles are – on payment tills, guiding customers, checking quality, packing bags, answering queries…. We also need to fill 3 roles as part of the nearly new sale core team. Logistics Coordinator, Volunteer Coordinator and Seller Coordinator. 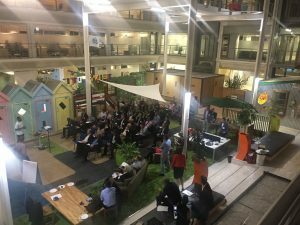 – Attend Core Team Meetings to help with other areas of the sale, pre and post sale. – Sign in and out all volunteers on the day of the sale and give volunteer briefing. 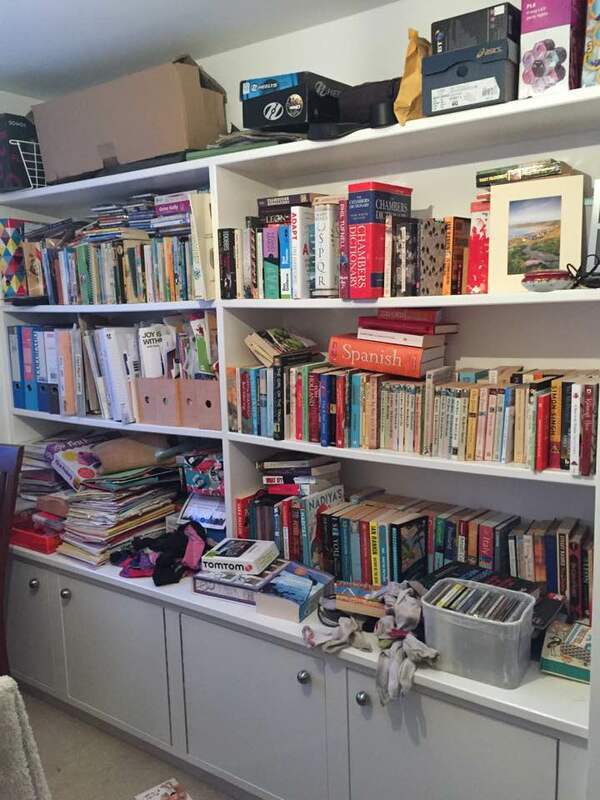 – Making sure clear up on Saturday is completed correctly before sellers come to receive their unsold items. Yay! It’s snowing! I know this is a complete nightmare for LOTS and lots of people but I LOVE the snow so I’m very excited about it, even if we did only last 10 minutes because my extremely strong willed 6 year old refused to wear her gloves and got very cold hands very quickly. Sigh! I’ve also been up since 6am stressing about keeping everyone updated on which schools and pre-schools are opened or closed so I am exhausted! lol. Anyyyyywaayy, this is my impromptu list of suggestions of things you can do with your little ones today whilst it’s snowing. Whatever you end up doing…HAVE FUN!!!!! Miss NHM’s school has sent a mail out to all parents saying that they have received a Cold Weather warning from Hampshire County Council today, with predictions of poor weather and possibly snow on its way. I have mixed feelings about this. YAY to snow but Eeeekkk to the logistical nightmare of it with work and Miss NHM off school. It’s about time we had some decent snow though. Snowballs, snow angels, igloos and snowmen. Yay!!! 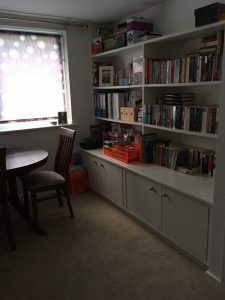 Thank you very much to Wendy for putting this post together on wordpress!!!! Did you know that many attractions are pay once, visit all year? This means if you keep the entrance ticket it allows you to return to the attraction for free in the following 12 months (some have additional terms and conditions such as gift aid). 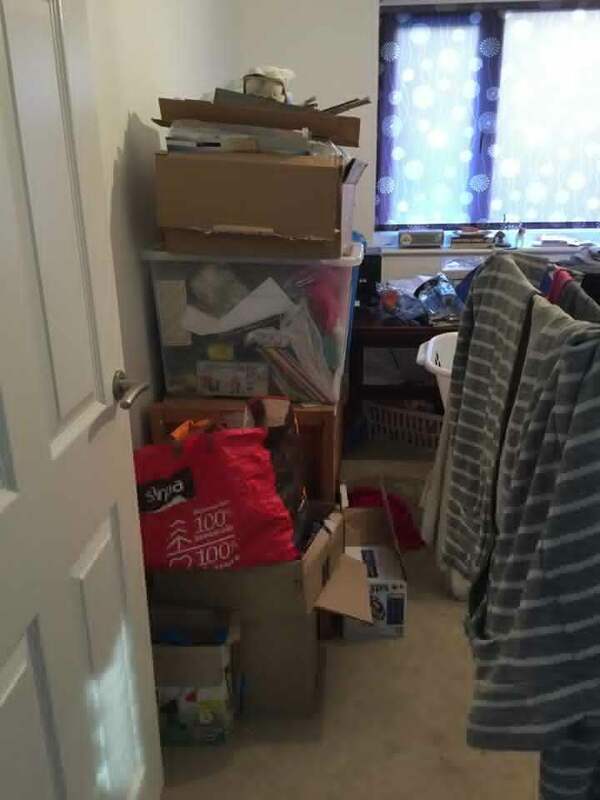 A recent post on “Buy and Sell Baby/Children’s Bits in Basingstoke” by Sarah-Louise asked group members to help create a list of all the attractions that offer this. We have taken a few of these, investigated the list and added too it. Museum of Army Flying – Stockbridge. Annual pass given free if you gift aid. We launch our company this month so wanted to let the NHM community know all about us. For further details please see our website or facebook page. We also offer vouchers and 10% discount for returning customers. 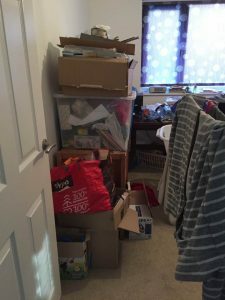 This isn’t your usual NorthHantsMum review. I can’t talk about play facilities, baby changing amenities, or whether you’re allowed to bring your own baby food. You see, this is a place for (whispers)…grown-ups. Yup. No bouncy castles. No gratis wet wipes. No fish fingers. This is dedicated to the grown-up world of work. But just because it’s for the big girls and boys, doesn’t mean it can’t be playful. So please feel free to hop, skip and jump into the Wonderland that is Desklodge. 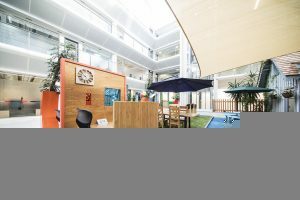 Tucked away in Basing View, less than a 10 minute walk from John Lewis/Waitrose, Desklodge describes itself as “an award winning co-working space”. Which basically means it’s an office for people without an office. If you’re a freelancer, p/t commuter, or start-up entrepreneur, you know the agony of working from home. The crippling loneliness. The faltering Wi-Fi. 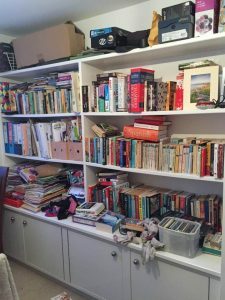 The siren call of ‘Bargain Hunt’. It’s here that the appeal of Desklodge, the salve for the self-employed, becomes apparent. 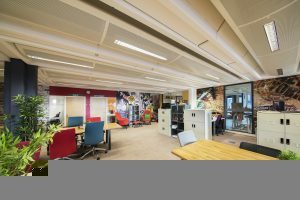 It offers a variety of working environments designed to suit all tastes and requirements, all under one roof. 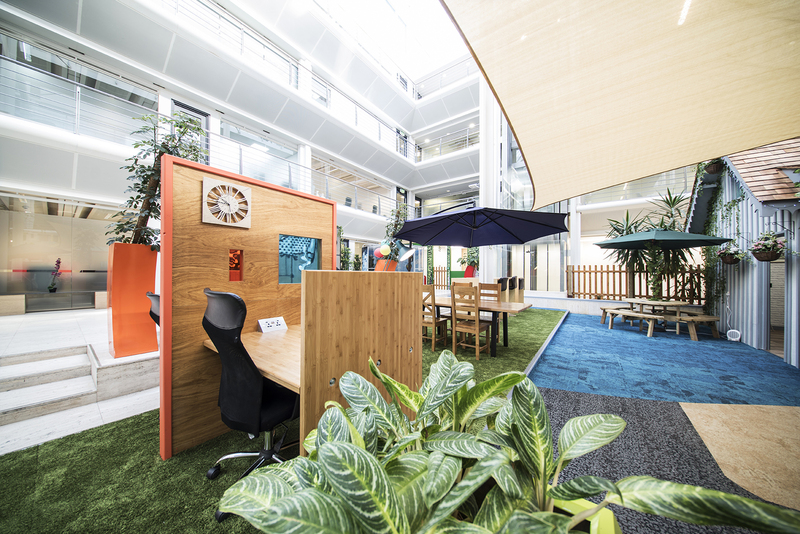 Fancy dropping in and grabbing a hot-desk for an hour or two? You can do that. Want a fixed desk to work on a longer project? No problem. Need a private meeting room to hold an interview? Not only has Desklodge got it, it’s got it with style. 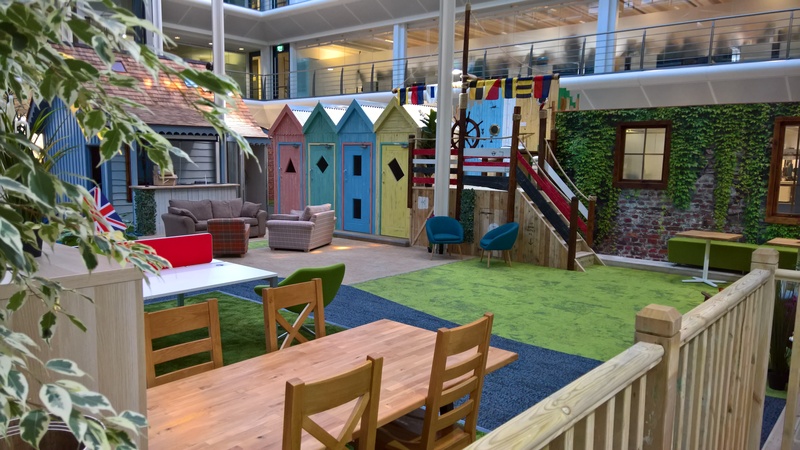 It may be set beneath Belvedere House’s amazing atrium, but you step inside the surf shack themed doors of Desklodge, and you’re not in Basingstoke anymore. With playfully designed work spaces (including a Zen room), phone booths disguised as beach huts, and a high-spec kitchen complete with ‘New York skyline’, dropping in on Desklodge definitely beats working in the library. It’s buzzing with a community of people from across a spectrum of sectors and industries, and networking is actively encouraged through their free seminars, workshops and socials (or just by the good old-fashioned water cooler). 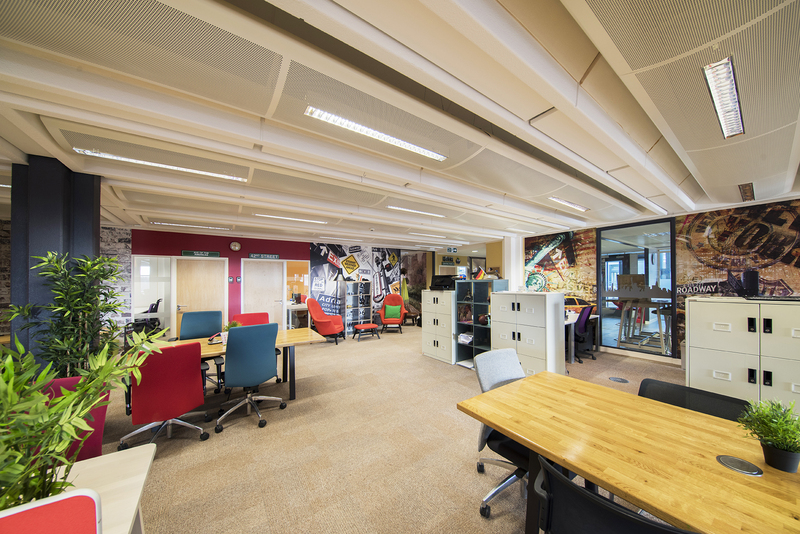 You can choose to drop-in and pay by the hour, take up a monthly membership or become a resident DeskLodger, with prices from as little as £3 an hour. That’s less than a fancy coffee in Starbucks. Oh, and superb 1GB fibre Wi-Fi, car parking (subject to availability) and tea/coffee is included in the price. How do they do it?! We don’t have anything even close to being like this in Basingstoke, and I sincerely hope this is a sign of things to come. 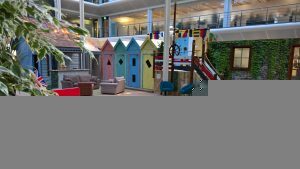 Festival Place can feel a little generic at times, so something as vibrant, creative and collaborative as Desklodge is incredibly welcome. 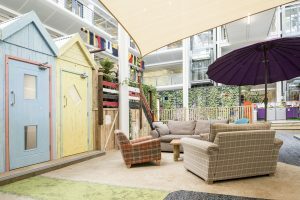 If you’re a freelancer looking for some space to focus, a business in-between offices, or even a stay-at-home parent needing a couple of hours to write an email, I would highly recommend giving Desklodge a look. And not a ball pit in sight. Bliss. 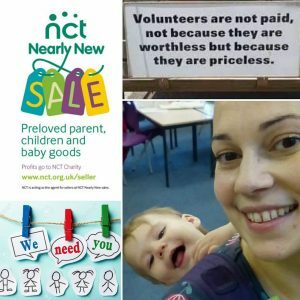 Thank you very much to Wendy, one of the NHM Awesome Support Team, for putting this awesome post together!!!! The fireworks have stopped, the John Lewis advert is out and the countdown to Christmas has begun. Below are some of the local places to visit Santa plus several other Christmas experiences that you may wish to put in the diary or book now including Christmas plays and Pantos. With school holidays starting late this year demand for weekend slots for Santa will be high so book early. Festival Place – Basingstoke. £4.50 per child. Lots of availability and probably the cheapest Santa visit locally. Henry Street Garden Centre –Arborfield. £9.99 per child, £2 per adult. Weekends and inset days are already fully booked but there are a few after school slots left and plenty of options for those not in school yet. Dobbies Garden Centre – Shinfield. £9.95 per child. Good availability, including weekends and Christmas Eve. Please click on the links for further details about these experiences. Wyevale Garden Centre – Sherfield on Loddon. A few dates left for Breakfast or tea with Santa. Millers Ark – Nr Hook. Lots of Christmas events including a Santa’s Grotto, Carols in the Barn and a Nativity with real animals. 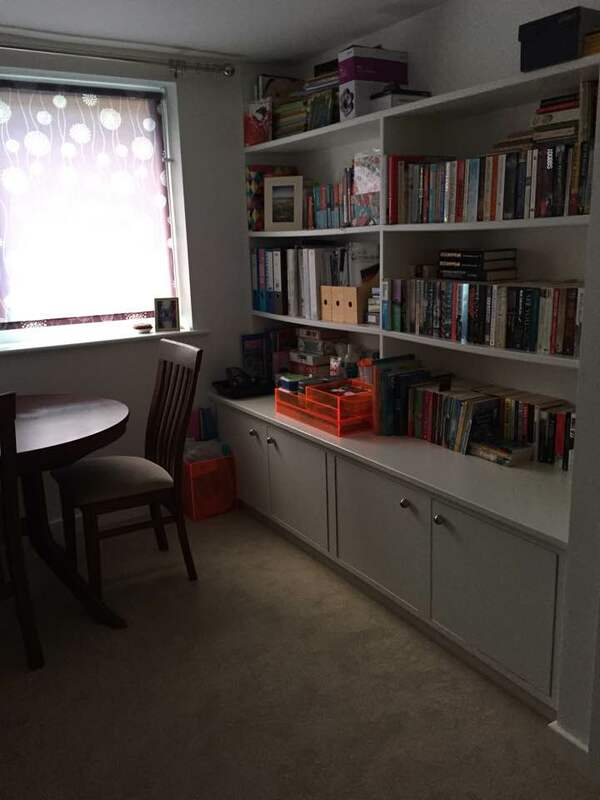 4 Kingdoms – Headley. Still availability for their Christmas experience. Finkley Down Farm – Andover. Limited availabilty for weekends. Lots of choice for week days. Basingstoke Canal – Mychett. This has already sold out for this year. Watercress Line – Alresford/Alton. Lots of dates still available, including weekends. Marwell – Winchester. Some weekend tickets still left. Lots of availability for week days. Winchester Science Centre – Winchester. Still lots of availability, includes SEN sessions. Paultons Park – Ower. Lots of dates still available. Lapland UK – Windsor. Lots of dates still available. The Malls – Basingstoke. Events start with Christmas light switch on Nov 17th at 6.30pm. Check their website for various other events in the run up to Christmas . Festival Place Santa Parade – Basingstoke. Dec 3rd at 12pm. Santa arrives at Festival Place. Basingstoke Festive Fun Run – Memorial Park Basingstoke. Dec 10th. Please check website for times. Basingstoke Festive Fun Run – Memorial Park Basingtoke. Dec 10th. Please check website for times. The Vyne – Basingstoke. It’s the last chance to go up on the roof at The Vyne and, like most other National Trust properties, there’s a Christmas Trail. Santa in Love – Central Studio Basingstoke. Dec 15th. For children age 2-5. Peter Pan – The Hexagon Reading. Dec 9th – Jan 7th. All ages. With Justin Fletcher. Snow White and the Seven Dwarfs – Mayflower Southampton. Dec 15th – Jan 7th. All ages. With Craig Revel-Horwood & The Chuckle Brothers. 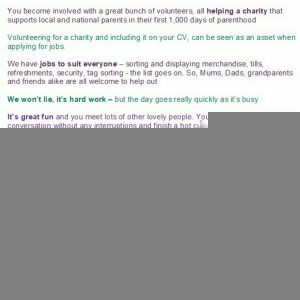 Please let us know of any events you feel should be added by emailing the details to NorthHantsMum@gmail.com. Thanks! I’ve collated these from previous posts on NHM but please add your suggestions in the comments on the NorthHantsMum FB Page and I will add them into this post. Thanks!! Build a Christmas item like a Lego Christmas tree, Santa sleigh, snowman, etc or with playdoh. Go see the Christmas lights or a street that has lots of decorations. Festival Place, The Oracle, Farnham and Winchester have good local ones. December 5th is Saint Nicholas Day, so do someone a good deed in his spirit. The French bake gingerbread as a tradition. December 21st is winter solstice so take time out from all those Pre- Christmas do’s and celebrate at home by cosying up with loved Ones. Christmas Nature Walk – Take a walk to your local park or woods and collect pine cones and see if you can spot a robin or some holly. Check out Nature Detectives to see what you can find. Go to a local school Christmas Fayre and pick up some fabulous bespoke Christmas presents. Make Christmas Gloop (put in a couple of baubles and some glitter) ???? Put together A personalised video message for your child from Santa (and it’s free!) (this is AWESOME!) and play it to your child. Visit a local library and find some nice Christmas stories, e.g. Father Christmas needs a wee! Give something back, make a donation. Print off some Christmas puzzles, word searches, colour pages. Watch the Santa Fun Run in Eastrop Park. Is there one on this year? 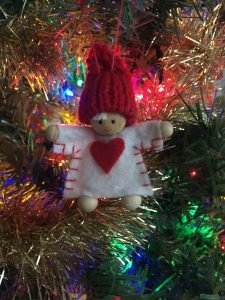 Listen to Christmas Music (there are normally dedicated satellite channels for music and films at Christmas!) or you can download your favourites from i-Tunes. Make Christmas crackers from old toilet rolls! Watch a Christmas movie. Which are your favourites? Sing the 12 Days of Christmas without saying Christmas. Drive round looking for houses with Christmas lights. Have a super duper Hot Chocolate – make your own at home with flake, marshmallows, squirty cream, etc or nip out to your favourite cafe. Catch a ride on the Santa Bus. Christmas i-spy – make a list of Christmas items to spot then go for a walk and tick things off your list. Thank you very much to Heidi W for her suggestions in 2014!!!! 8. Go and see a Christmas show either at the Anvil or the Haymarket. 16. 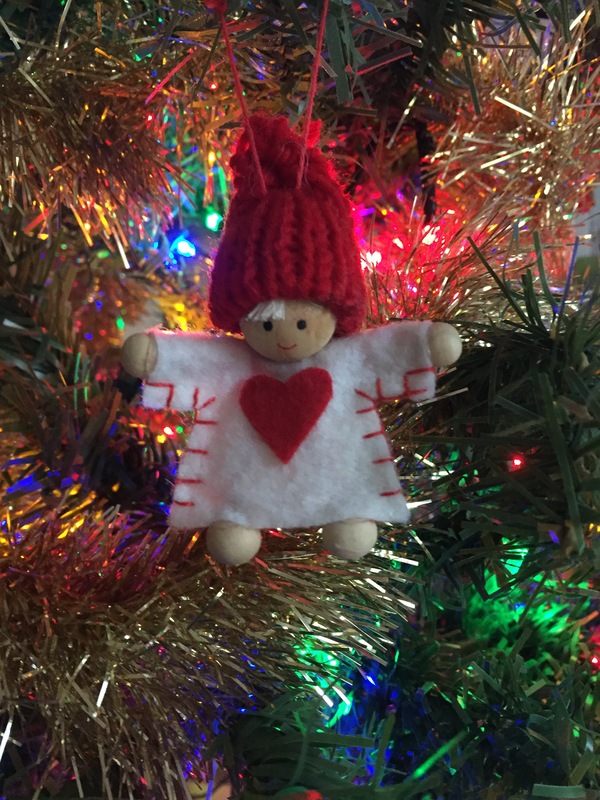 Do a Christmas Craft together – e.g. foam Christmas tree kit, make Christmas crackers, Christmas baubles. I’ve recently just invested in a Season ticket for a local attraction. I wanted somewhere that was near to Basingstoke, that we could just pop into after work or when my husband is at work on the weekend. Paying for entry to attractions can be very expensive, but if you find somewhere that you like, and you know you will visit maybe once a month, it makes sense to invest in a Season ticket. You also get discounts and extra perks with most Season tickets. I am planning to get a season ticket for a different place each year, so we don’t get bored of the same places. This is an exceptionally long post. Sorry about that! It was really difficult to know what to include, so I’ve tried to include the key highlights and the costs. Hope you find it useful! Please note: Terms and Conditions do apply. For full details, please see ‘Terms and Conditions’ on their website. How much does a Season Ticket cost? An Annual Pass enables each person purchased free admission to the farm park for 1 Year from date of purchase. Ideal for a short visit even after school for a quick play on the playground or all day in the holidays. Also if you purchase a pass before your child turns two they are free the duration of your pass. There is also a Childminder’s annual pass, details can be found on their website. Please note: Terms and Conditions apply. Access to the Park for one calendar year from the date of application. …and, by becoming a season ticket holder, you are actively supporting the conservation projects that Beale Park undertakes, as well as contributing towards the care of the animals. It’s easy to join. Simply print out the form on the website and bring it with you to the Beale Park ticket office where, on payment, a photograph will be taken and your application processed, enabling your season ticket to be produced. Why not become a Farm & Deer Safari Park member and enjoy access to the farm and deer park throughout the 2017 season? An ideal opportunity for numerous short visits either after school, school holidays, rainy days, to visit the animals, go round the deer park on a tractor, safari or deer expedition, have a stroll or just for the children to let off steam!! All our park attractions are included in the price with the exception of special events. Joining costs you the equivalent of around £5 per month. Make six visits and then go FREE! The membership includes a 10% discount on group party bookings for 2017. This can be used for birthday parties but also your children’s class (only one discount per class can apply!) at school – well worth mentioning to your children’s teacher. We also offer all season ticket holders a very special 20% discount in Woody’s for ten visits – great for breakfasts, family lunches or just coffee and cake with friends (excluding special event menus). Enjoy their 12 Special Events through the Summer Season for the price of 6: Purchasing an annual pass costs less than the equivalent of 6 visits over a twelve month period. You can visit 4 Kingdoms 7 days a week throughout the year: An annual pass runs for a full twelve months from the date of purchase. “Try Before You Buy”: When you go to 4 kingdoms on any day and buy day tickets for you and your family, if you buy an annual ticket before you leave you will have your day ticket refunded (T&C’s Apply). An Annual Pass gives you 10% off your child’s special birthday party event at 4 Kingdoms: Choose from any of their special themed birthday parties and get 10% off the price. An Annual Pass gives you 10% off their magical Christmas Event: Join them for a magical Christmas family experience and get 10% off the ticket price. Visit 6 times And Every Other Day Is FREE! Unlimited Visits – As an Annual Pass holder, you can visit Birdworld as often as you like, be it for half-an-hour or a full day. Just show your pass with photo at the Information Desk on arrival, thereby avoiding any queues at Admissions on busy days. E-Newsletters – Their regular newsletters will keep you up-to-date with happenings within the Park, so you’ll hear all about new arrivals amongst the birds, fish, reptiles and animals on the farm, seasonal activity in the Gardens, and generally be aware of what’s going on around Birdworld. You may opt to receive this via E-mail. Annual Pass Holder Events – You can join their team for exclusive events at Birdworld, which are only available to our pass holders. This includes our annual supper evening, which you can enjoy at no extra cost. Discounts & Special Offers – Annual Pass Holders are eligible for a 10% discount on any purchases from the Gift Shops (excl. foods), and 15% discount on Birdworld Birthday Parties. You will also receive special prices for our Santa’s Winter Wonderland. When buying your pass you will also receive a one off 10% voucher to use on many products at Forest Lodge Garden Centre. If you are still not sure, then visit Birdworld for the day and they will be pleased to refund the cost of that ticket against the pass if you decide to join on the day. By becoming a member you can be an invaluable part of our mission while enjoying as many visits to the Hawk Conservancy Trust as you like – not to mention many other benefits throughout the year. Conservation membership and life membership are also available with additional benefits, details of which can be found on their website. Terms and conditions apply to all membership packages. The Living Rainforest review on NHM (The standard admission price entitles the purchaser to an Annual Ticket, which allows free entry for one year, so keep your receipt!) NOTE: the prices have increased since the review and can be found on The Living Rainforest’s website. We have been very excited (and tired) in the J household. Small J has been upgraded to Big J with the arrival of his little sister. With that we found ourselves in need of a buggy with a ‘big brother seat’ for when he is too tired to go any further. After a bit of online searching I came across a new local business ‘Buggy Magic Valeting Basingstoke.’ Run by Emma Lyons the company buys, makeovers and deep cleans buggies giving them some TLC and a new lease of life for their next owner. 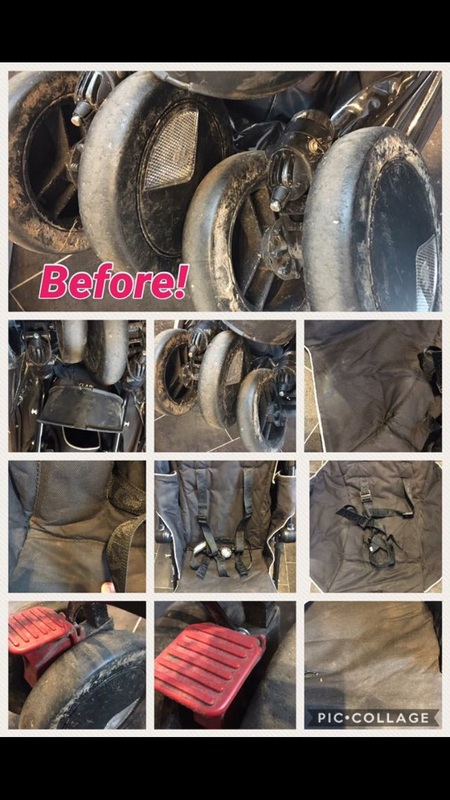 You can also have your existing buggy cleaned thoroughly. 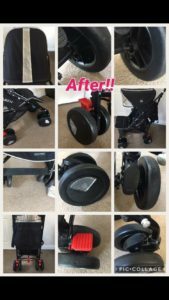 I love recycling, reusing and upcycling and the idea that unwanted buggies are getting a new lease of life rather than landing in the rubbish dump makes me very happy. Emma answered my Facebook enquiry very quickly and was able to send me photos of suitable buggys she had ready to go as well as descriptions of some more she was still getting ready. She helped me choose one that met my requirements, my only concern was Big J might be a bit tall for it. So the following day we went to give it a test run with Big J on board. He was delighted with his big brother seat and Mother in Law J declared it easy to push. Emma gave us a full rundown of how to assemble it and all the different configurations the seating could be in and even loaded it in the boot for me to check it would fit. We are very happy with our new wheels (for the time being it appears Big J’s legs are permanently ‘too tired!’) and will be returning to Emma after the winters mud to have it all cleaned off. 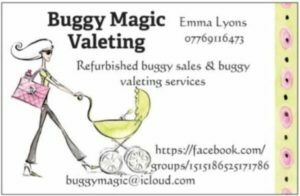 Buggy Magic Valeting Basingstokes available stock and current valeting price list can be viewed on the facebook page of the same name. Emma can be contacted via the page for any enquiries.